In conversation, the artist Mickalene Thomas, and her partner and muse, the art consultant and collector Racquel Chevremont, have the couple’s habit of interrupting each another, talking over one another, and seamlessly picking up where the other left off. While this makes the task of interviewing them somewhat challenging, it gets to the heart of their new project Deux Femmes Noires. Years in the making, and debuting at the Volta New York art fairOpens a New Window. with a curated show, “The Aesthetics of Matter,” they’re setting out to increase visibility and opportunities for artists of color through two areas of focus: first, by working directly with artists to provide guidance and career opportunities; and second, by curating shows, advising institutions, and securing funding for exhibitions. The goal is to push artists of color—with an emphasis on female artists of color—to greater prominence in the art world. Thomas and Chevremont, respectively, bring different, but complimentary expertise to the table in this mission. For Thomas, it’s the first-hand experience of negotiating her own path to considerable stature in the art world as a queer artist of color. For Chevremont, it’s the experience of seeing the inner workings of how shows are produced, and how institutional structures play a crucial role in what gets seen, how pieces get bought and sold, and by whom. By applying pressure in these two areas, Deux Femmes Noires aims to break loose and create more opportunities. With “The Aesthetics of Matter,” which opens on March 7th, Thomas and Chevremont are mounting a kind of visual mission statement with a group show of young artists of color loosely organized under the wide-ranging banner of collage. On a snowy day in February, we sat down with Thomas and Chevremont, as well Devin Morris, one of the young artists selected for The Aesthetics of Matter,” to learn more about Deux Femmes Noires, the challenges that artists of color face in the art world, and how the dialogue is and is not changing. THE STANDARD: What made you decide to start Deux Femmes Noires and where did the idea come from? MICKALENE THOMAS: Well, you don't learn any of the business side of the art market in art schools. Most of the artists that we've come to support and love were getting themselves into some really compromising situations that were detrimental to their practices and trajectory. CHEVREMONT: At the same time, there was another conversation we were having about female artists and artists of color, in general, and how difficult it is to get museum shows and spaces to actually give you solo shows because of budget decisions and the lack of underwriting. We felt that we needed to try to figure out how to navigate that, and help support younger artists by trying to get them into institutions that we have connections in. THOMAS: We were having so many younger artists coming to us asking for advice on a regular basis. They would contact either Racquel or myself asking questions about how to run the business side of their studios. One day we were like, “You know, we should really figure out how to make this something legitimate and make it function in a way where we can really assist and give proper advice to artists who deserve and need the support. THOMAS: What's exciting is, as an artist with my experience, and my career, and the growth of it, I feel like I can bring firsthand experience based on the opportunities that I've had, and also some of the missed opportunities. And with Raquel's expertise as a collector, consultant, and advocate for women and people of color in the arts, collectively we created Deux Femmes Noires. For many artists who are getting started, one of the biggest challenges is finding a gallery to represent them and show their work. Is this an area where you see Deux Femmes Noires playing a role? THOMAS: I think for most artists their first inclination is to go to bed with a gallery before even knowing much about that gallery. My question would be, “Ok, what gallery do you want to show with? Who is this gallery? What type of artists does this gallery show? Is that the route that you should take for your career?” To learn about that and really understand why you would want to be with specific galleries because that may not be the only direction. There are a lot of artists whose careers are not developed solely through the commercial art market. We’re really looking at other opportunities, and alternative spaces, venues, and institutions. CHEVREMONT: I think some artists rush into it. Maybe you’re in school and a gallery approaches you, and you're like, “I need to figure out how to make money because I have student loans. I'm an artist and here’s this gallery telling me they're going to be able to sell my work. This is something I need to do.” Mickalene took years before she got a New York gallery. their financial situation, their communities and life experience. For me, I understood my situations very well. I knew what I could do and what I couldn’t do. Most importantly, I knew what my work was doing and what it wasn’t doing, and I knew that I was not ready to be in a commercial New York gallery. So I started working with a gallery in Chicago. I didn't care about what other people thought if I didn't feel like my work was ready. I knew I wanted my work to be strong once I entered the NY art market. CHEVREMONT: These are the kind of stories that you need to share with young artists because they think that you just came from somewhere and suddenly ended up on the covers of art magazines and in museums. They need a little bit of guidance and they need to know that there are people who want to support them. Most people don't really understand the mechanics of how shows come to be. Could you explain a little bit about that and how you see yourselves as being able to steer work into those spaces? You mentioned that the art world has changed and that different platforms now exist. Can you talk a little bit more about that? THOMAS: I think the landscape has changed because we're now a much more global, international market. There's accessibility to various art markets via the internet. We are able to connect and have conversations through these new social vehicles. When I started coming up as an artist, you had to be in New York City. If you were coming out of school talking about how you were going to move to Detroit or LA, people looked at you like you were crazy, like you were committing career suicide. You were in New York or you were nowhere. That's not the case anymore. New York is not necessarily the art hub anymore. [The art world] has grown and dispersed and there are so many great places for artists to live and make work. Many artists, curators, and art historians have moved out of New York. Major art institutions are supporting their local artists and partnering with alternative spaces. There are more opportunities for young or emerging artists to make their work and a living. These new enclaves are fantastic for artists coming out of graduate school. You can focus on making work. Now you can be anywhere in the world. If you're making great work, the curators and collectors will go where you are. CHEVREMONT: Accessibility has changed the art world dramatically, and that’s been a good and a bad thing for artists. CHEVREMONT: I think the downside is that there are some artists now who are more concerned with celebrity and social media and how many likes they get on a piece, and it's influencing the work to some extent. It's crossing a point where I see some younger artists are not handling it well. For instance, a lot of artists are sharing works-in-progress [on social media] and I have some concerns about that. You want to keep that mystery. When you have a show and everyone has already seen everything before it arrives, it can diminish its impact. Devin, can you speak to that as a young artist? DEVIN MORRIS: A lot of artists are interested in ‘likes.’ I've been trying to focus more on being quiet and not finding a drug-induced benefit to social media, or thinking that you're popular because you’re popular on Instagram. But in another way, you get requests from galleries via Instagram now. Or galleries will follow you and you can follow them and that starts a relationship. There’s this interesting play now with my generation where you can control how you want to be seen. It's this interesting line you have to straddle. I think at the end of the day, choosing not to be a celebrity is the best one, but it's hard because you end up being confused about if you’re communicating enough. 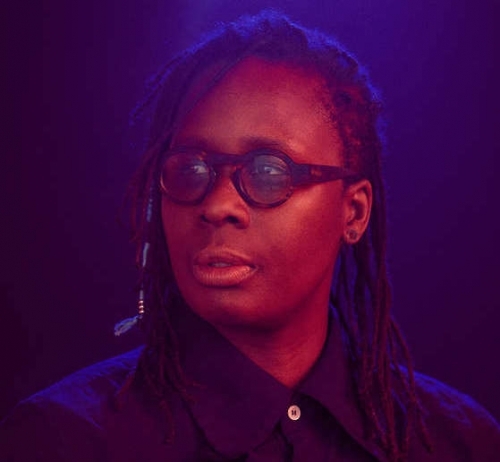 THE STANDARD: Mickalene, as far as the evolution of your career, what kind of mentorship experiences did you have, and did those experiences play a role in shaping your desire to curate other artists’ work and develop Deux Femmes Noires? THOMAS: Absolutely. I think it's really important for artists to define and create their support system of friends and community. For me, it was my community at graduate school, and after that, where I was living in Brooklyn. There was a really small group of artists and we did everything together. We ate together. We partied together. If one of us had a small group show in the East Village, we all went. We carried each other. Now looking back, ten, fifteen years later, we're all doing our art and are successful in various ways. I also connected with some really good faculty and instructors. I have one instructor who I've known since I was an undergrad who still comes by my studio before I have a show. He's someone that I really respect and go to and say, “Hey, come by and check out this new body of work, I want to see what you think.” You reach out to people that you trust to be very honest with you about your practice. To me, transparency and honesty are really important. There's no benefit to seeing anyone fail if you're their support system. As far as the Volta show, “The Aesthetics of Matter,” is it correct that the show is loosely organized around collage? CHEVREMONT: That's correct, but it’s not collage in the literal sense. THOMAS: The way I look at collage is as an ideology that allows artists to work through different materials, whether it be text, language, sculpture, performance, photography. It’s this amalgamation of different materials, different spaces, different ideas, and different experiences—that's our world today. We are hit with so much socially, culturally, politically, and the question becomes: how do you process that as a creative person? How do you take that back to your studio? And what comes out of that? CHEVREMONT: With the political upheavals that are going on, we thought of Dadaists and how they turned to collage. We were like, “How are young artists processing this?” It is through the process of collage even though it doesn’t look traditionally like collage. Artists have a myriad of materials and mediums accessible to them right now, therefore it no longer needs to be the traditional paper collaging process. THOMAS: All of the works looks different. The notion of collage has been redefined. It's not the traditional notion anymore. It can’t be. We're different people. We have evolved. It’s about grappling with all of these different aspects, and making sense out of them. It may not look like what anyone expects. That's what “The Aesthetics of Matter” is. You mentioned the dramatic upheavals happening beyond the art world. Do you think the dynamics within the art world are changing for female artists and artists of color? CHEVREMONT; It might be changing. I hope it is. I'm hopeful that it's not just a soundbite for 2017 and 2018 and that it is something that people take to heart and decide that, “OK, it's time. This needs to change.” I feel like artists of color are receiving more opportunities, but it’s still not level—not just for artists of color, but for female artists. So yes, you hope that this environment is going to change things, but it's been that way for a very long time. We do have more women who are heading institutions, who are running museums, especially in New York, but they have boards, and those boards are still filled with people who have their own ideas. Until that infrastructure changes, the change is going to be slow. It needs to start with the people who actually make the decisions, and they tend to be the people with the money. Until that infrastructure changes, and there are more women and people of color in those positions, there's not going to be a dramatic change. THOMAS: It’s not about something being fixed. It's about taking action. It's about a state of mind, a state of being, and a state of doing. You can't have one without the other two. We are evolving, but we're holding on to old traditions. There's hope because we're have new conversations. Put gender on the table. We weren’t speaking about gender at the level that we are today, nor using words like intersection to describe the gray areas. CHEVREMONT: And the youth are actually addressing that in a powerful way, but they're not in positions of power. Until that generation actually gets into those positions, we may be dealing with a lot of the same things. MORRIS: I’ve been thinking about this a lot. What I’ve noticed is that some of my friends have jumped [to higher positions within institutions]. The administrators are now women and people of color. So, on a very basic level, you’re allowed in the door to do things that maybe four years ago you wouldn’t have been able to do. You see a lot of women getting hired because there’s such a push back, but the genuine reasoning is not always there. A lot people want to discuss where we were. Having a conversation is beautiful. But having eight panels a year to discuss something is weird if there’s no viable actions on the table. That’s where you get down to who is really managing these ideas, who is managing the institution. I’m very happy today that a lot of artists are speaking to who they are and what they see, and not in a way that’s didactic. I’m not interested in being limited in how I create because of certain notions of how my work should look. I think more artists are challenging that. That has to proliferate because as work enters the market, over time that work will help change and sooth the symptoms of whatever the issue is. Volta is the first manifestation of this initiative. Where do you want to go from here? How you see it developing and where you want to go beyond that. CHEVREMONT: We already have a list for another show we’d like to put together. We're working with some artists individually on special projects. There are some artists who we truly believe in that we feel have not been given the opportunity that they should have been given. And we're hoping to step in and get the work out there to make that happen using whatever influence we may have. We just want more visibility. We want artists to be seen. And that's one of the most difficult things for artists of color, and so, for us, that's the goal. It’s getting the work out there. There's so much incredible work and the opportunities are so slim.